Thank you! Don't forget to click the confirmation link in the email we just sent you. This article originally appeared on DelmarvaNow. Hallie Gregory, the longtime athletics director for Holly Grove Christian School and the University of Maryland Eastern Shore, died Sunday, Sept. 17, after leaving a major mark on the sports community across Delmarva. Gregory first came to the Shore in 1989, where he was hired as the top man for UMES athletics. The Indiana University graduate was responsible for several core decisions dealing with the school, including the creation of the William P. Hytche Athletic Center and the additions of soccer, bowling and tennis. The Hawks’ athletic director held his position until 2000 and was later inducted into the Maryland Eastern Shore Athletics and Mid-Eastern Athletic Conference halls of fame. But it wasn’t just his ideas and accomplishments that allowed him to leave a lasting legacy — it was also his character, personality and positive attitude toward everyone he encountered, said those who knew him well. Six years after Gregory left UMES, he returned to Somerset County to take the same position at Holly Grove Christian School, where he also taught physical education and brought multiple sports to the school. According to Clark, one former Holly Grove student who enrolled in the military and is stationed in Hawaii is returning to the Shore for the funeral, displaying the impact Gregory had on the Holly Grove community. 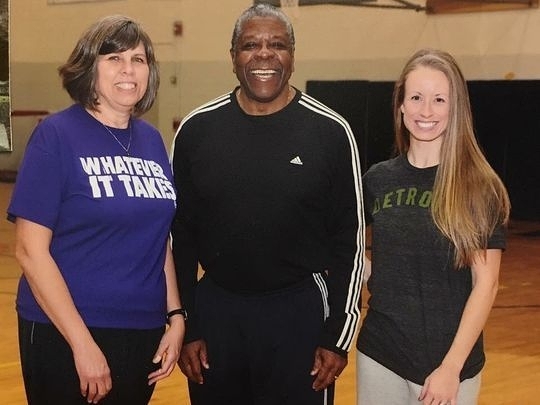 Several students and faculty members took to social media to post tributes, expressing their love for Gregory while recalling memorable experiences they had with the longtime educator. Clark recalled one former student mentioning she had dropped an AP class just so she could sign up to be Gregory’s student aide at Holly Grove. Gregory also had ties to Delaware State, Central State University in Ohio and the U.S. Coast Guard Academy, leaving a mark throughout the eastern United States. At all his stops, Gregory always made the most of his time with an organization, building a program that would be competitive and send a positive message to its athletes and individuals. Though his time as athletic figurehead has come to an end, the mark that Gregory left on those he dealt with will live on. Whether it was his contributions to UMES or leading a Bible study group at Holly Grove, Gregory developed relationships that won’t soon be forgotten. As Clark walks into the Holly Grove gymnasium every day, she stops and remembers everything Gregory did for athletics and for those he encountered.